Want to learn more about risk informed gambling practices? Below you will find links to a range of content on the topic. These links are provided for your convenience and information. GRINS does not endorse, nor are we responsible for, the content of external sites. Please use at your own discretion. Annapolis Valley Health Gambling and Healthy Communities: Position Statement: In this position paper Annapolis Valley Health (now Nova Scotia Health Authority) provides insights into the impact of gambling in the community. In this paper it is noted that the unemployed, those with lower education and individuals struggling with mental healthy and addiction have higher levels of gambling harm. AVH provides solutions that can be made through policy and legislation changes along with a strategic plan to lower the marketing of gambling. http://www.gov.ns.ca/tch/pubs/ResponsibleGamingStrategy2011.pdf: The new Responsible Gaming Strategy is our government’s opportunity to revisit and rethink its approach to gambling into the future. This strategy follows 2005’s A Better Balance: Nova Scotia’s First Gaming Strategy, in which the previous government tried to create a better balance between revenue generation and social responsibility in delivering gambling in the province. https://www.gov.ns.ca/hpp/addictions/gambling/gamblinghelpline.asp: Problem gambling website which provides information regarding how to get help and general information about gambling. http://www.gov.ns.ca/hpp/yellowflag/: It’s one thing to pick up a lotto ticket now and then, or grab a couple drinks with friends, but how do you know when these habits are turning into risky behavior? There are certain signs — we call them “yellow flag moments” — that could signal the beginning of future problems. http://www.nsact.ca/about_nsact.htm: The Nova Scotia Association of Counselling Therapists. NSACT became a non-statutory, self-regulating body in 1999. In order to better serve and protect the public, the organization has developed a comprehensive set of Bylaws, and adheres to a nationally recognized Code of Ethics and Standards of Practice for professional counsellors. http://www.togetherwecanwin.ca: Gambling Awareness Nova Scotia (formerly the Nova Scotia Gaming Foundation) is a not-for-profit, arms-length government organization that encourages and supports an independent response to gambling harm in Nova Scotia. 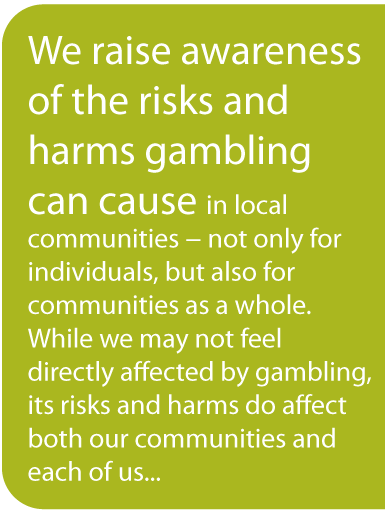 Gambling Awareness Nova Scotia (GANS) provides funding to community groups and researchers to help address and raise awareness of gambling harm. http://www.bcresponsiblegambling.ca/: The Province of British Columbia is committed to promoting responsible gambling and addressing problem gambling. This commitment takes the form of a partnership involving the B.C. government, the British Columbia Lottery Corporation, B.C.’s gaming service providers and local governments.